Lake Effect's Mitch Teich with former WNBA commissioner Donna Orender, and Lisa Attonito, executive director of the Women’s Fund of Greater Milwaukee. Title IX is a federal law passed in 1972 that seeks to provide equal opportunities for women and girls in any academic setting that receives federal funding. The law turns 45 this year, and it’s most visible and associated work has been in intercollegiate sports, where colleges and universities were required to bring women’s sports and sports scholarships into line with those offered to men. Women’s Fund of Greater Milwaukee executive director Lisa Attonito says that Title IX's mission, and its impact, go much further. "There's always some talk around, 'Why is this girl focused or women focused?' Well, Title IX doesn't only apply to the female person. It's really to create equity for all people in relation to educational funding and entities," she explains. In fact, athletics is only one of ten areas addressed by the law. According to Attonito, Title IX also impacts access to higher education, fair treatment for pregnant and parenting students, employment, bullying and sexual harassment, and even standardized testing. Donna Orender, a college and professional basketball player, and the commissioner of the Women’s National Basketball Association (WNBA) from 2005-2010, says that she is incredibly grateful for Title IX and the changes she has experienced under its implementation since the 1970s. Orender will deliver a keynote address about some of her experiences during a Women's Fund of Greater Milwaukee event on October 25th. "(Sports) is a vital engine to create opportunity and develop people's internal power," she notes. "Why is (Title IX) important today? Because we can't let it slip back...I think we really have to focus on how we want to be in the future. And that is this commitment to developing all of our young people - male and female - with equal opportunity side by side." Orender says that her professional position with the WNBA - and the league itself - "undoubtedly wouldn't have existed if it wasn't for the opportunities created by Title IX." She recalls that when she was playing in the American Basketball League, she and her teammates would wrap loaves of bread in tin foil for their lunches. "We didn't have any kind of these additional benefits that has since come along with sports, or even what the boys had at the time," says Orender. "We played because we loved it passionately...Certainly it wasn't an equitable playing field." Although it was not equitable at the time, she still believes that having the chance to play on that platform was important. "I think the opportunity to be able to showcase as elite athletes and communicating that to young women and their families, but young men and their families, that women are capable and they're physically strong, and that what they do at a high elite level is worthy of fandom," Orender says. 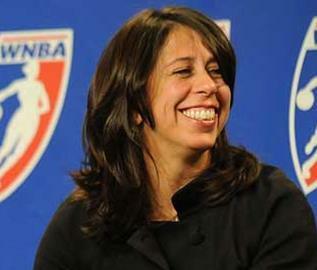 Their experience as a league was "a good stake in the ground at that point in time" that planted the seed for the WNBA to come not long after, she explains. When Orender was growing up - only one in 27 girls played sports. In fact, she had to play tennis on the boys team because a girls team simply did not exist. "Now, one in two and a half of girls play school sports...so we've made a lot of progress in participation. Are we there yet? No we're not," Orender says. "We still have a ways to go in terms of our overall cultural acceptance and support of young and grown women in the athletic endeavor." Attonito says the Women's Fund event is not just to celebrate what the law has done, but to showcase that it still has value today. "This law that is 'old' is not outdated. It still has value and can help advance equity (for all people)," she says. Orender says Title IX represents the opportunity that is the gateway for accomplishment, achievement, social change, cultural development and growth. "The spot on the playing field is just so significant in unlocking so many other relational doors for creating a better community and society...A lot of this is about educating. I think we all have a lot to learn together and we should take the opportunity to do that if we want to create change - and I know that we do." It is no secret that women’s inequality is still a significant issue in today’s society. Many women still earn only 79 cents for every dollar earned by men for the same jobs. Torpedo-shaped boats raced along the Menomonee and Milwaukee Rivers this weekend, as rowing teams competed in the annual regatta. It was the 17th Annual Milwaukee River Challenge. Proceeds from a weekend benefit will sponsor a new program to help diversify the Milwaukee Rowing Club. Race and Ethnicity Reporter Aisha Turner visited the Rowing Club's middle school team over the summer to learn about its efforts to bring new participants into the sport.